These days the red brick factory that once housed that stately pleasure dome is long gone, but this new cafe in the ground floor of the residential tower that has since replaced it takes the name of its one-time Madame. 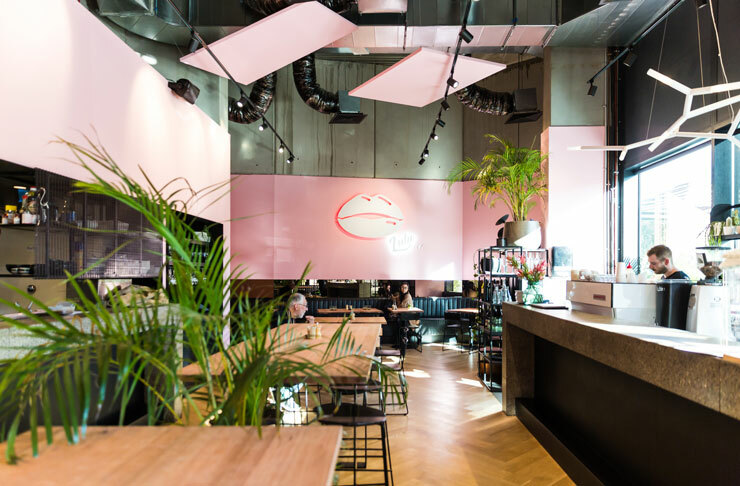 Local design company TOFU has splashed the towering concrete walls with powder pink paint and mounted a blinking backlit luscious lips sign, complemented by Giffin Design and Christopher Boots lights. Distressed leather banquette seating wraps around oak parquetry floors and a stone espresso bar and kitchen add class. 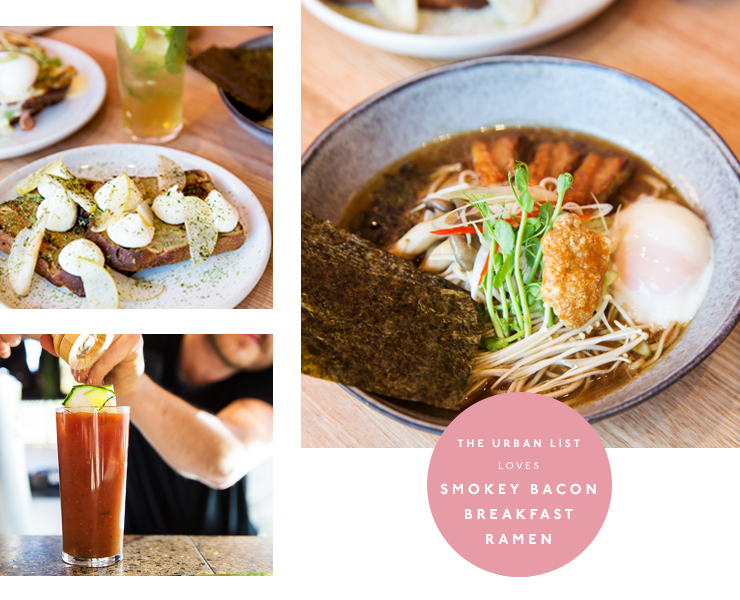 The menu runs with the fun too, throwing off the restraints of smashed avo and scrambled eggs to offer some playful options, with the most intriguing hanging out in the ‘naughty’ section. Of course, if you do hanker for porridge, that’s an option from the ‘nice’ column. Served with apple and rhubarb, it can easily be corrupted by adding an optional nip of whisky. Breaking the rules is a recurring theme on the House of Lulu White breakfast menu, where Christmas comes all year round in the shape of the What a Croque. Topped with a poached egg and applause-worthy whipped smoked cheddar that had us salivating before the plate even touched down, this doorstep-sized croque monsieur packs thick-cut Christmas ham paired with deliciously gooey raclette. Alternatively gorge on the crispy buttermilk-fried chicken waffles with nahm prik-spiced maple syrup, garnished with coriander. If you’re in a hurry, lunch kicks in early at 11.30am, with a fish finger sandwich paired with pickled carrot, cucumber and sweet potato fries or hulk up on a Flat Iron steak baguette with roast onions, creamy cheddar and beetroot pickle. Goodies from the group’s The Hamptons Bakery & Café are perfect for afternoon or morning tea. We gorged on the almond and fig loaf with peaks of whipped peaks on on-trend matcha and yuzu ricotta. Fridays kick on until the early evening, with shoestring fries, Sticky PX sauce lamb ribs and tempura eggplant with burnt honey on stand by for nibbles while you imbibe a glass of North Run Harcourt Shiraz or Zuccolo Friuli pinto grigio, and you can extend the pleasure with Saturday and Sunday morning bottomless brunch sessions. Offering 90-minute non-stop cocktails, take your pick of bloody Marys, espresso martinis and mimosas and drink up.